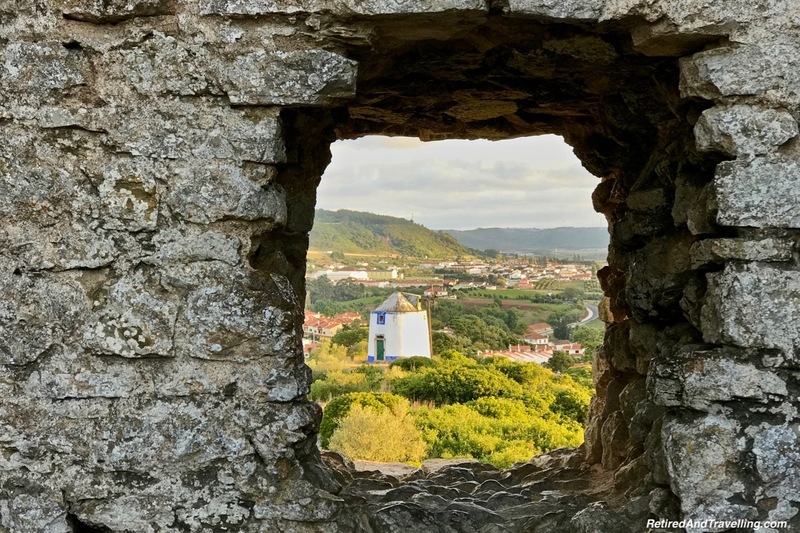 We could see the walls of the city from afar as we drove up to Obidos. 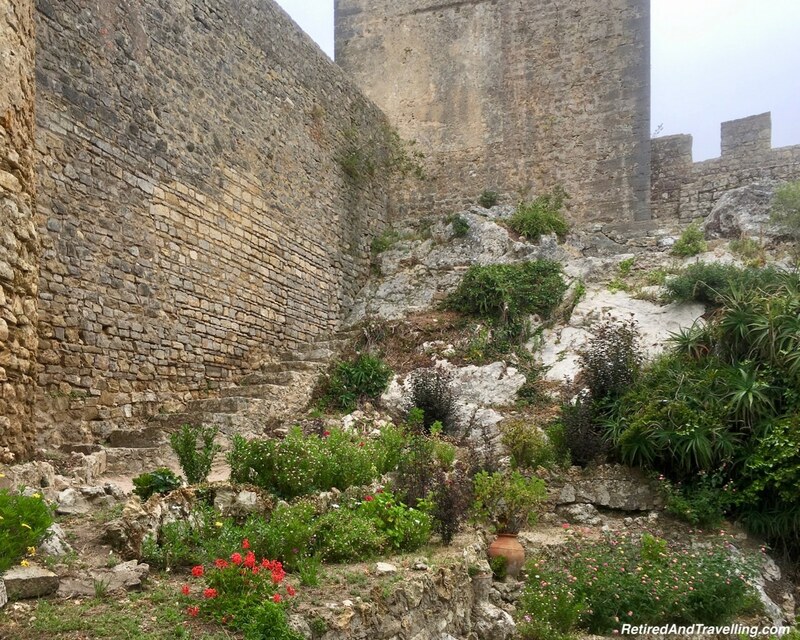 When we got inside the walls, we saw the steps that go up to the wall. There was a map that showed the points where you could get up. 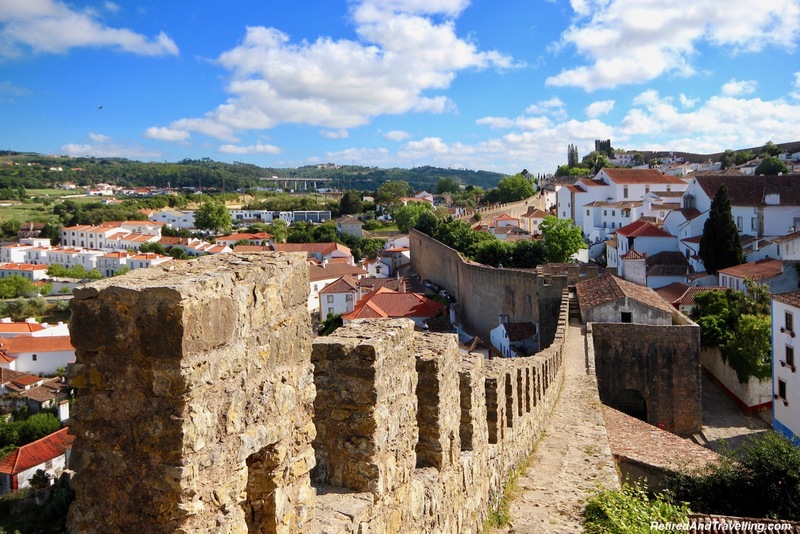 We would not miss a chance to walk on castle walls in Obidos during our stay inside the walls. 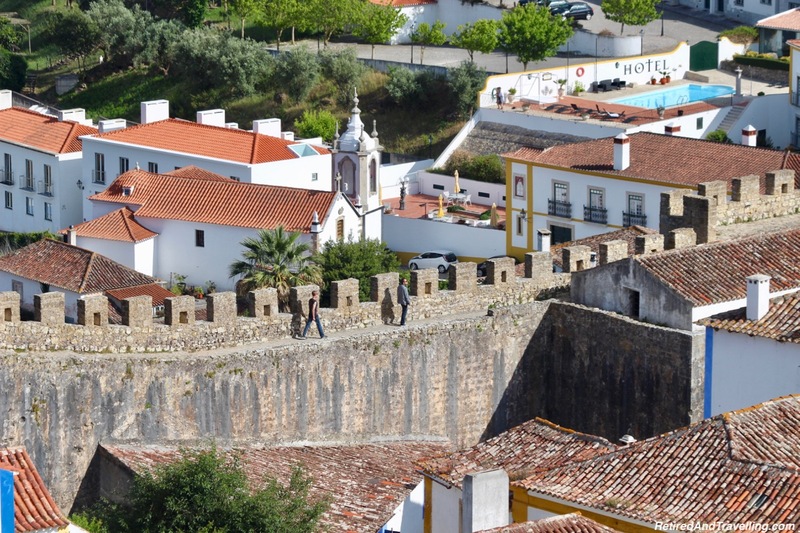 The walls go around the walled city from the ancient castle that is now a Pousada hotel. 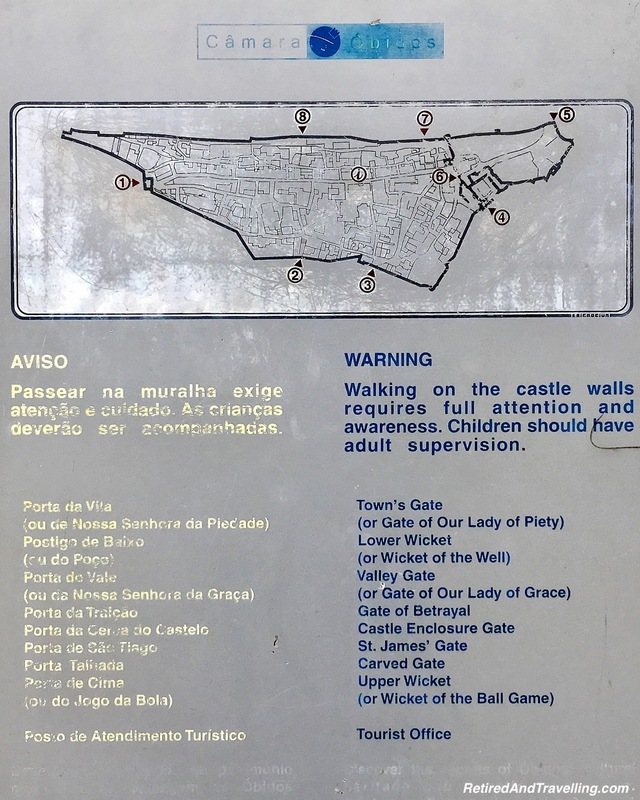 You can go up or down on either side of the castle and walk around. 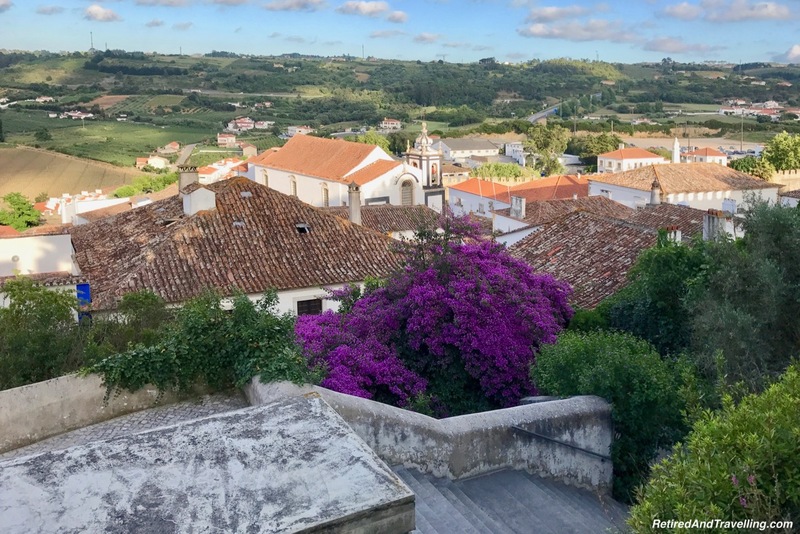 As we travelled in Portugal, we quickly learned that a “mirador” meant a viewpoint. 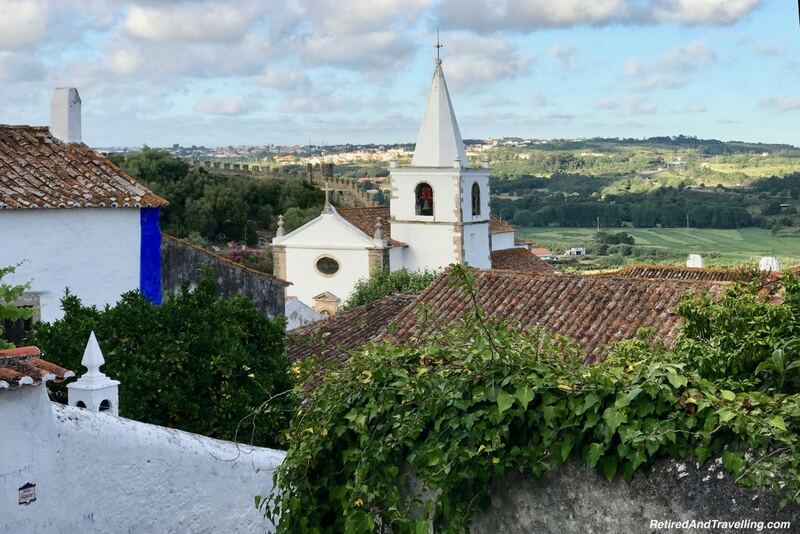 We climbed to miradors in Lisbon to get a view out over the city. 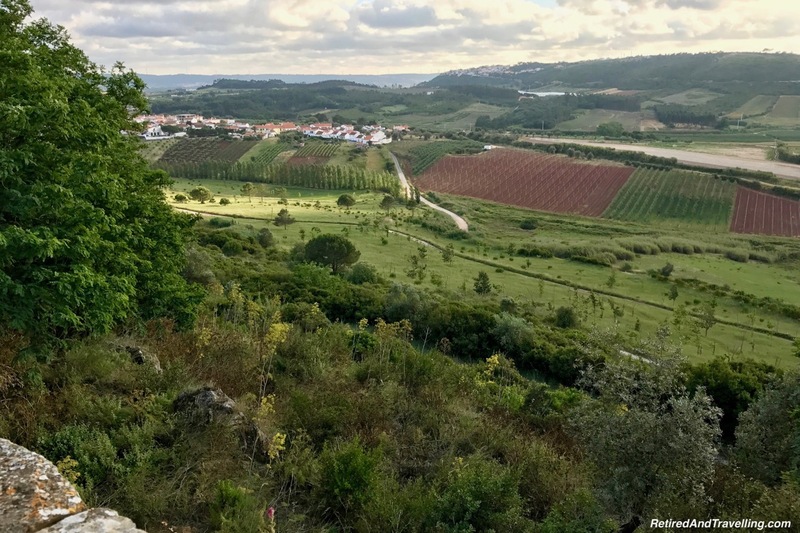 Stops at miradors when we drove along the Douro River Valley gave us great panoramic views of the river and wine valleys. 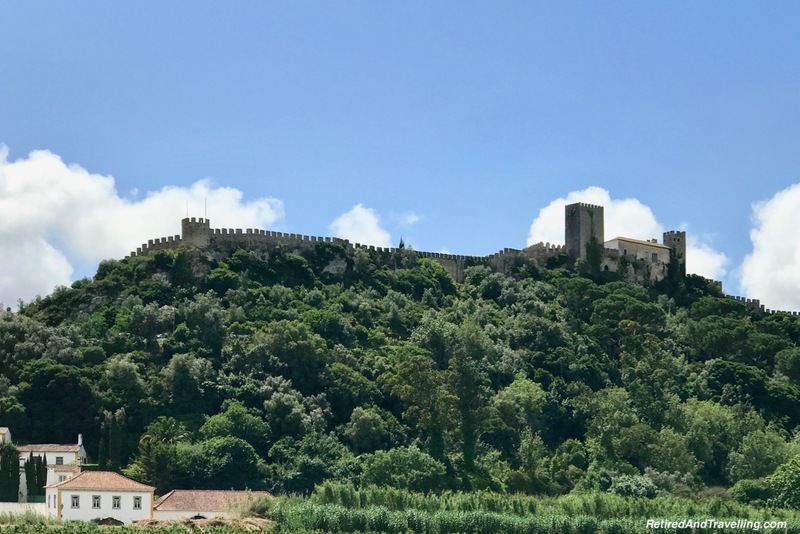 When we saw the sign for a mirador in Obidos, we headed up. 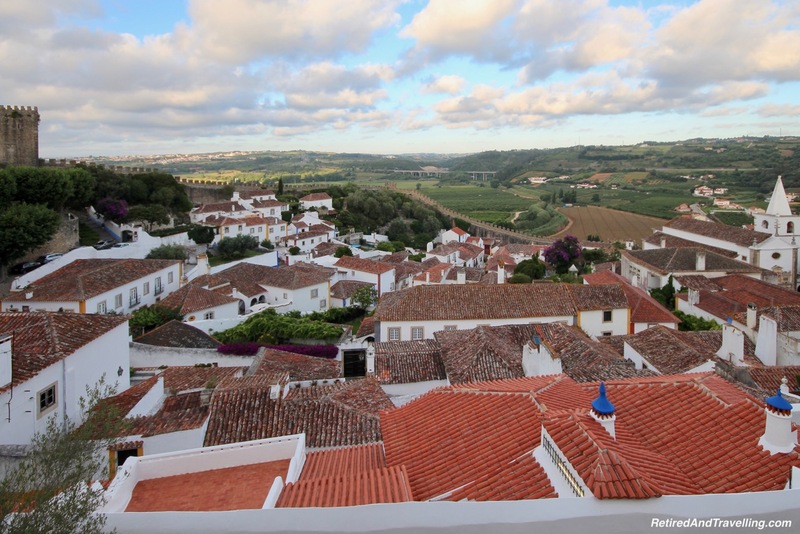 As we climbed we got better views out over the town of Obidos. 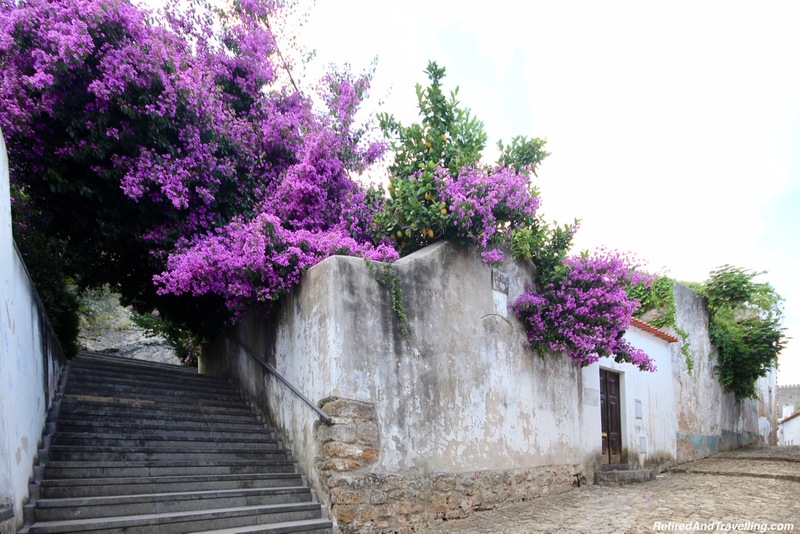 We could see many of the churches that we explored around Objidos. 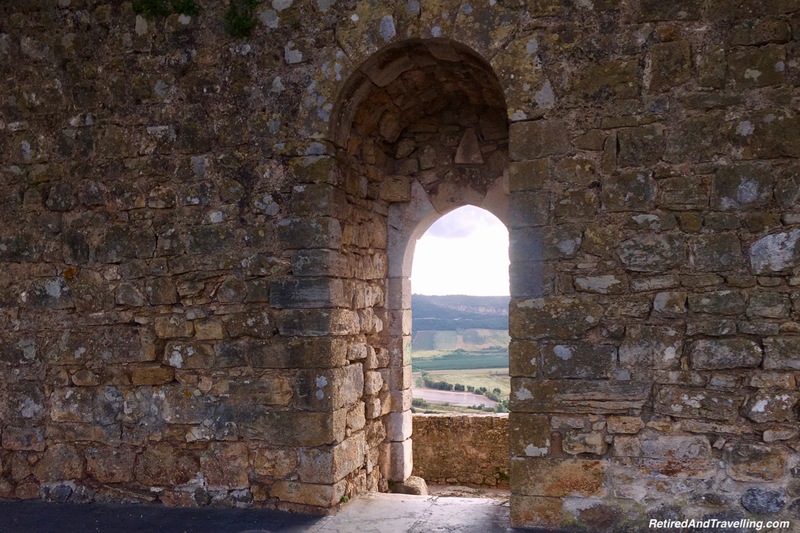 When we reached the top, we went through the portal to see what was on the other side. We got a great view out over the fields outside the gates. A rough path lead up to a path around the outside the castle walls. 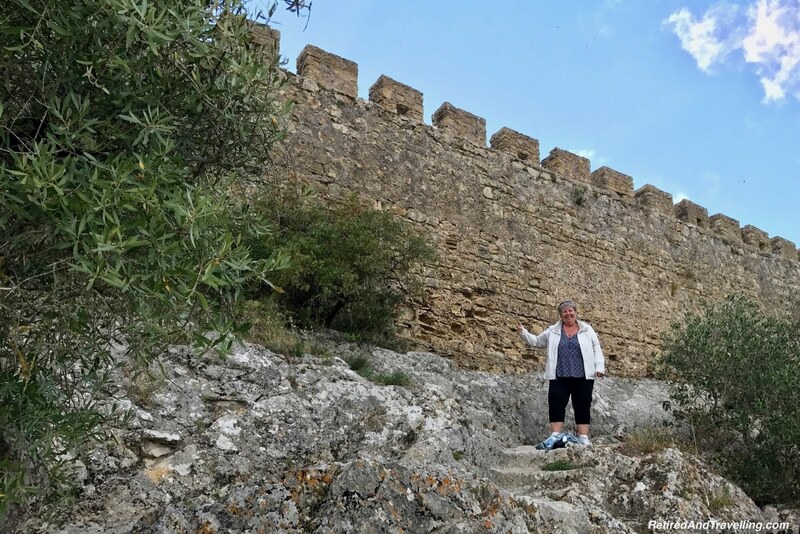 Since we were headed still higher to walk on the castle walls, we passed on walking outside the walls. 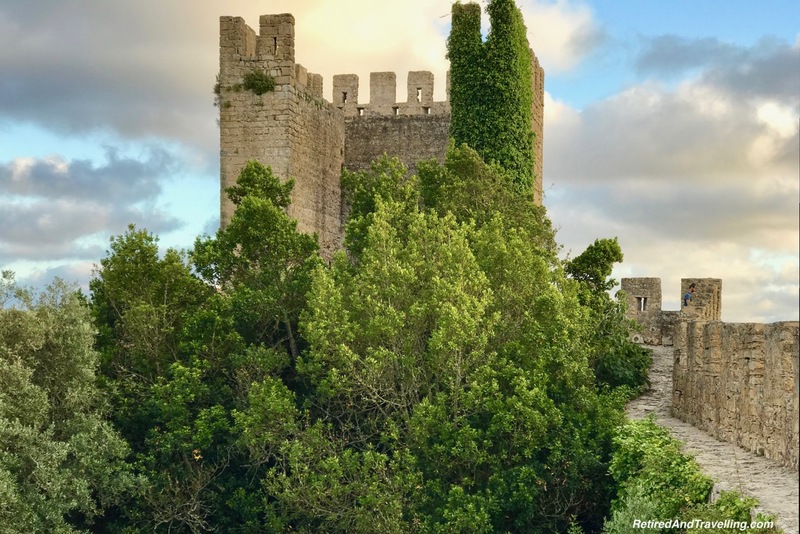 We stopped to enjoy the view over towards the castle. Then we headed that way. 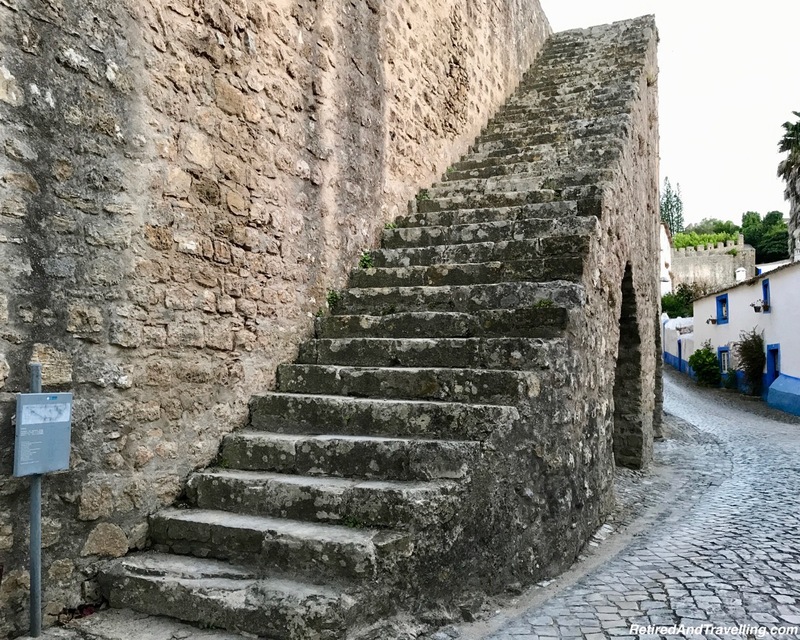 We were looking for the stairs by the castle to get up on the walls. 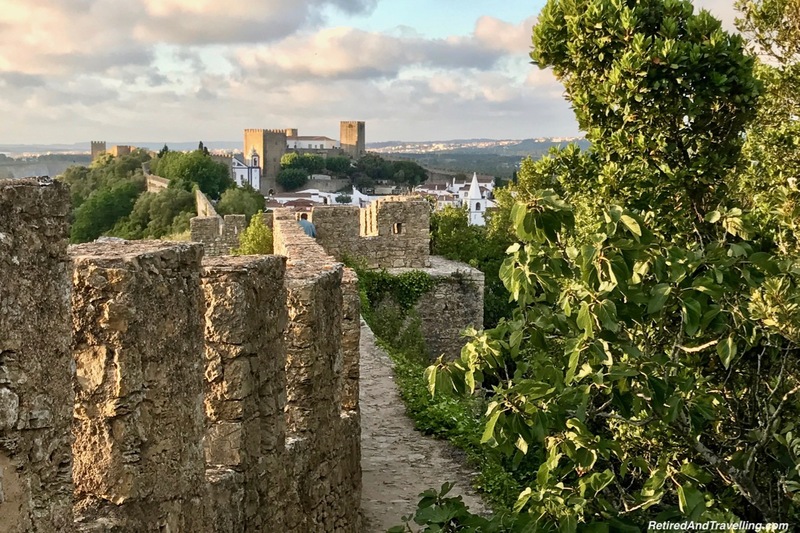 There are several places to get up to walk on castle walls in Obidos. 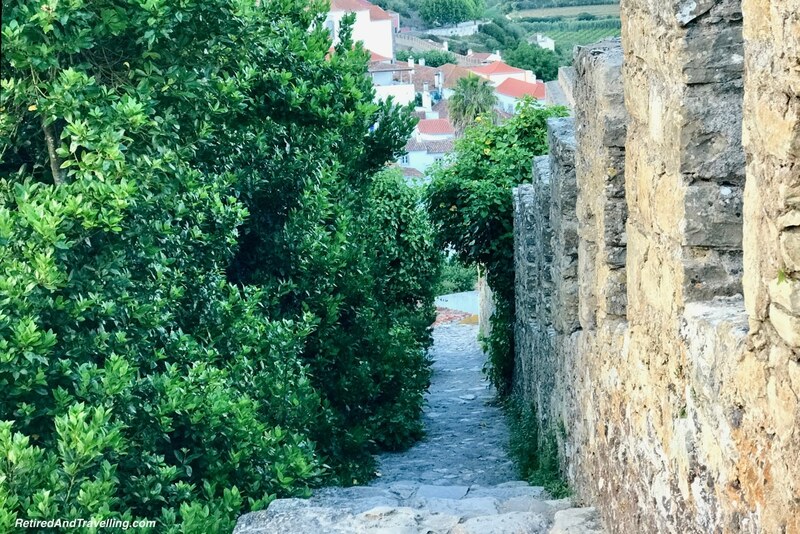 The path up varied by the point you chose. 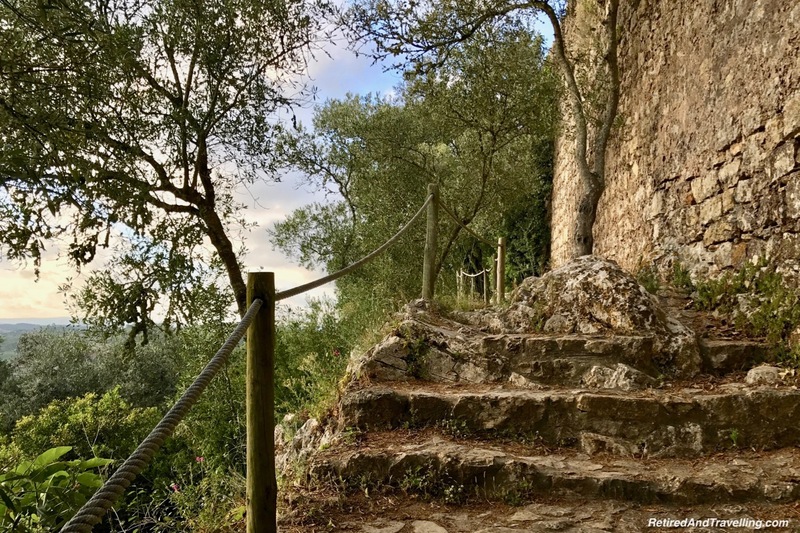 Some were high flights of stairs and other were rocky paths. We went up on a rocky path and came down on a very high set of stairs. 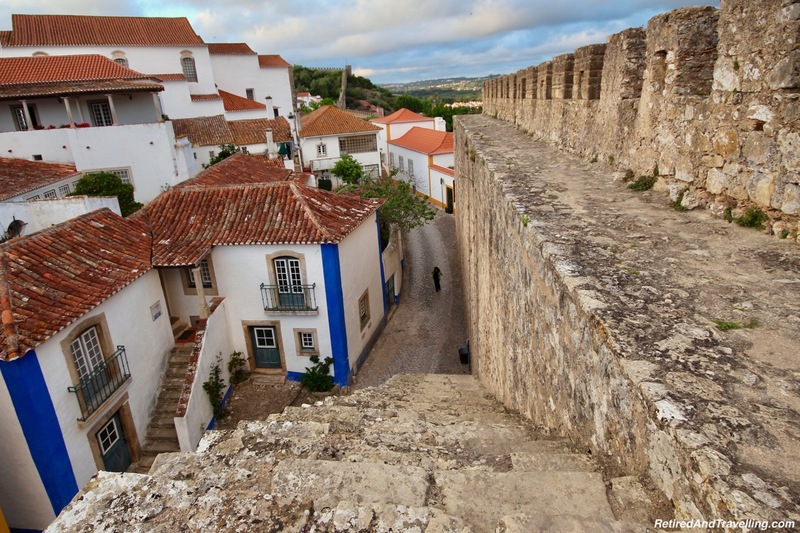 Once you get up on top of the walls, it is a quite narrow path. The rocks are mostly rugged but in places they are shiny from wear. 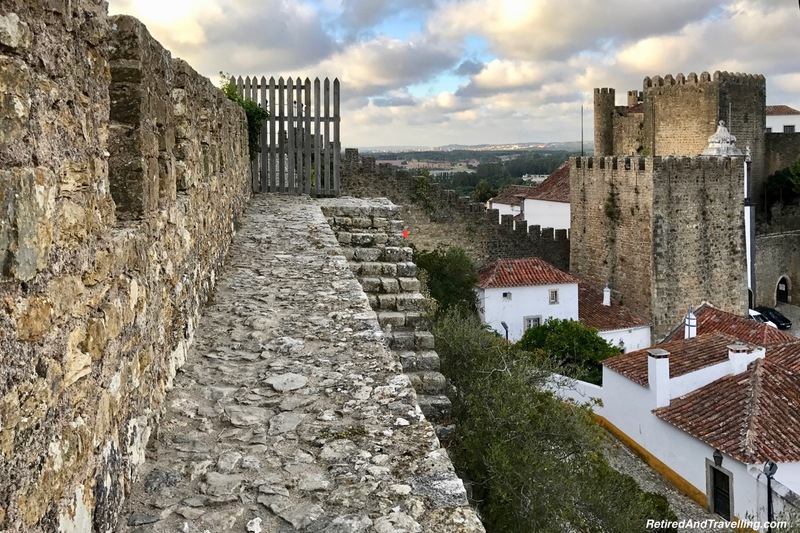 While we saw people walking two abreast, we were much more happy going single file on our walk on castle walls in Obidos. The path made sharp 90 degree turns as it went around the town. In places the path went up rough stone stairs. In others, it went down. 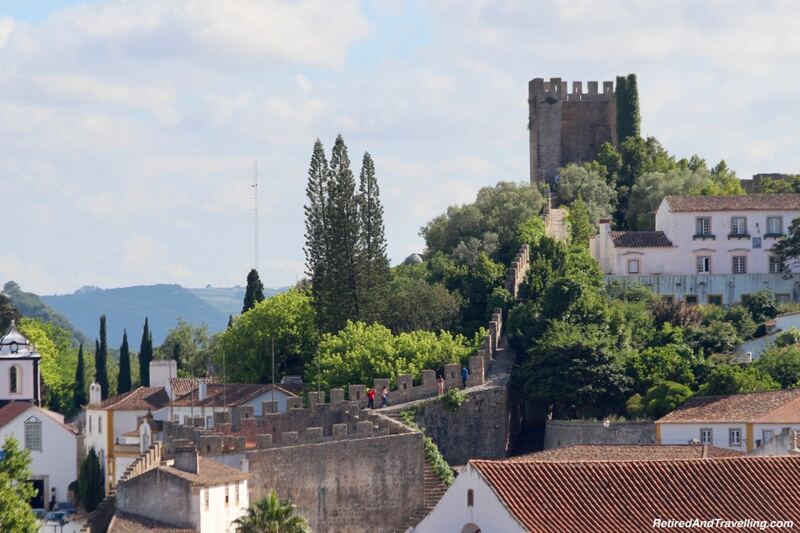 At one end was the old castle and the Pousada hotel. 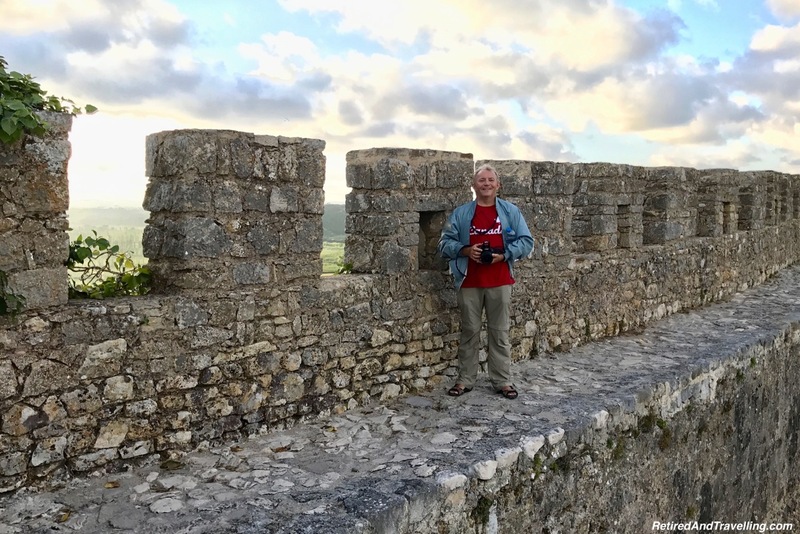 At the other end was a tower. 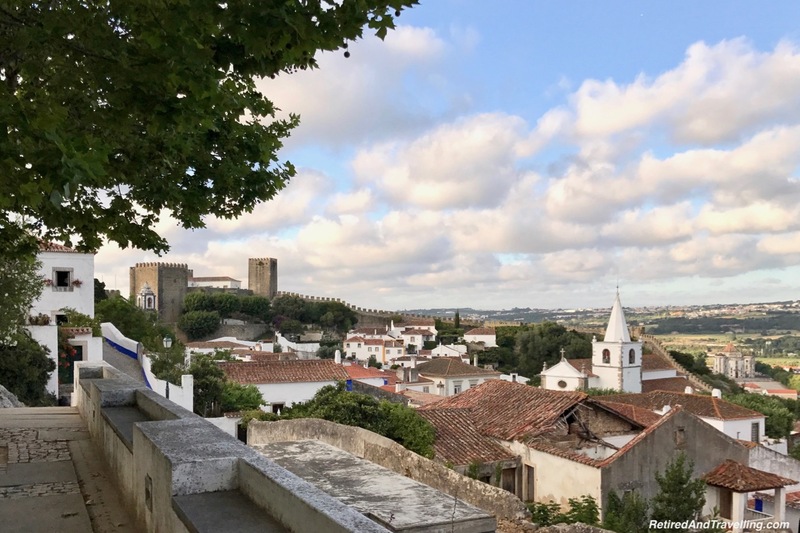 David climbed up the stairs for the view back over the town of Obidos to the castle. I stayed on the lower level and caught the view out the window. 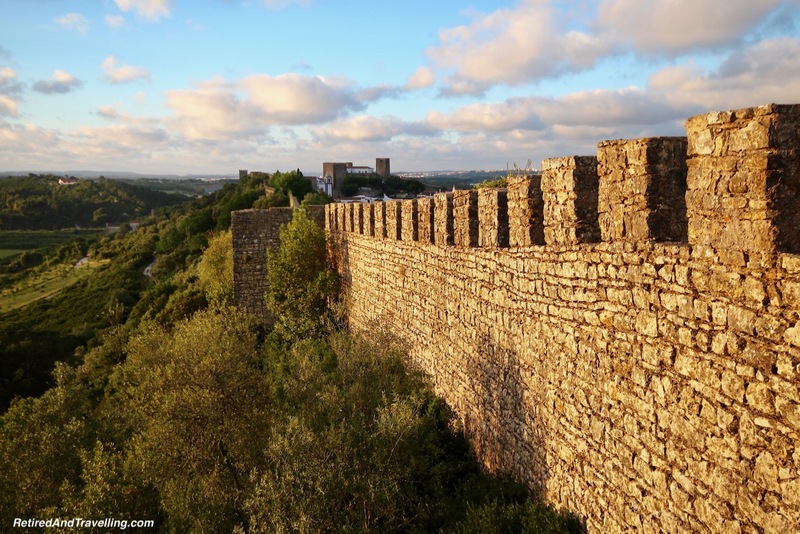 There were no guardrails at all either to hold along the wall or to stop you from toppling over the edge. 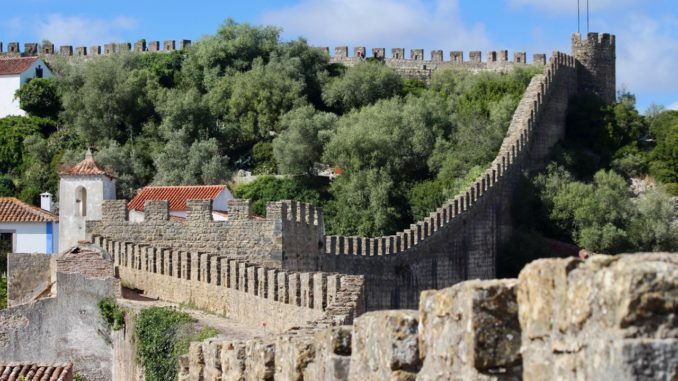 There was no question that we were not in North America with its tight safety laws. 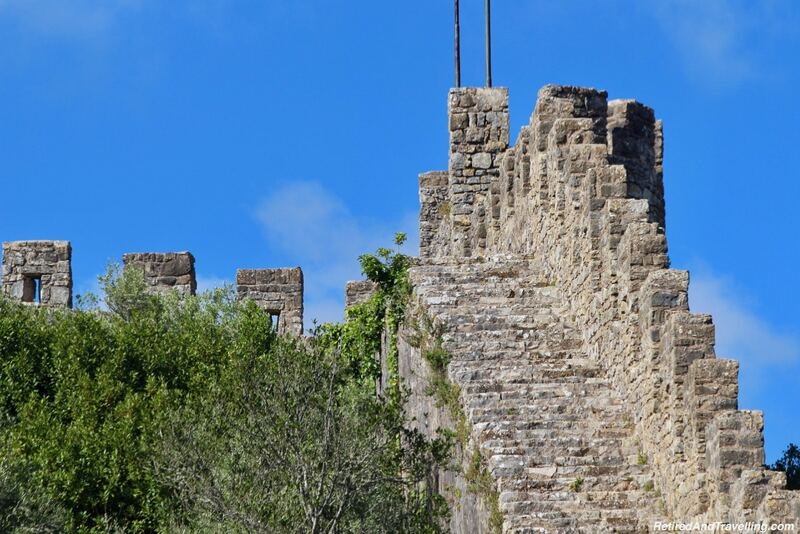 But we moved slowly and carefully and it was no problem to walk on the castle walls in Obidos. 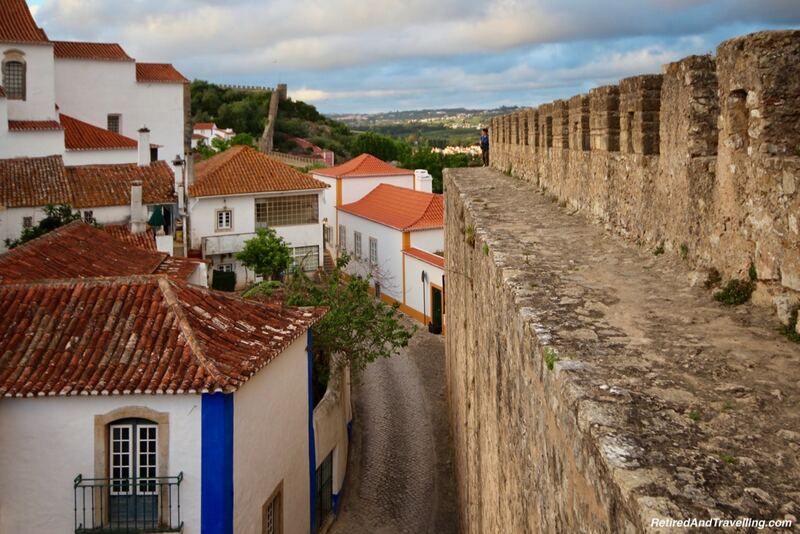 If you are afraid of height or have mobility issues, then you should probably pass on a walk on top of the walls. 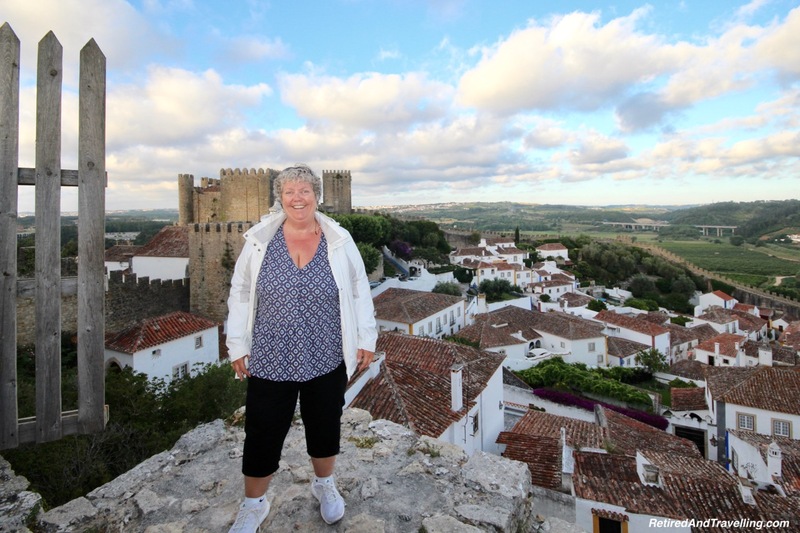 We walked much of the town of Obidos. 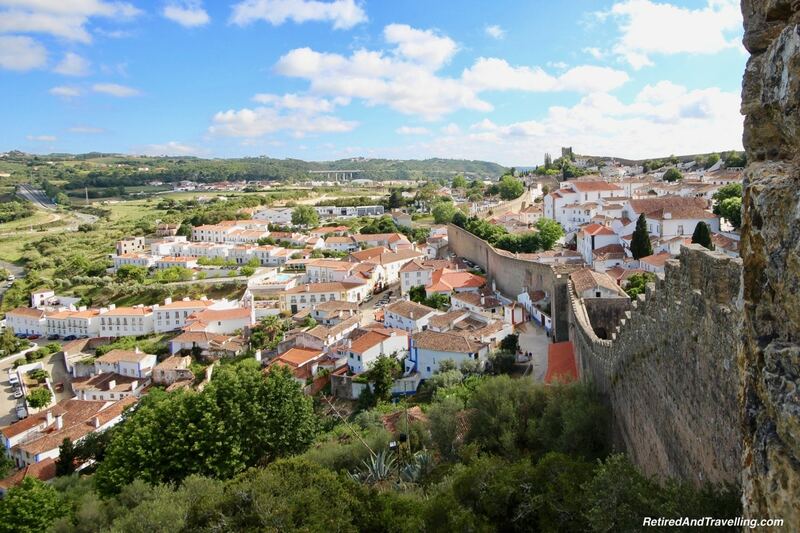 But if you do walk on castle walls in Obidos, you will be rewarded with great views of the town from above. 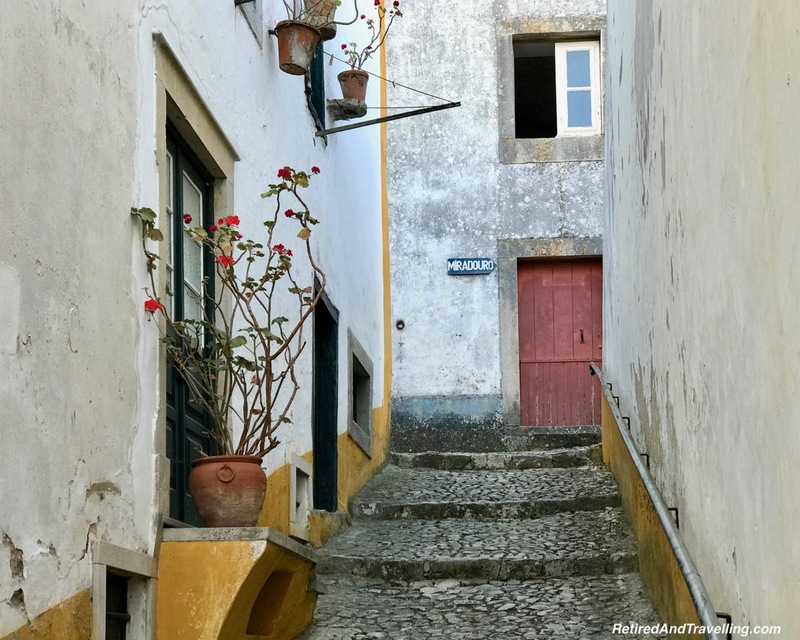 We saw the tiny alleys winding their way through town. 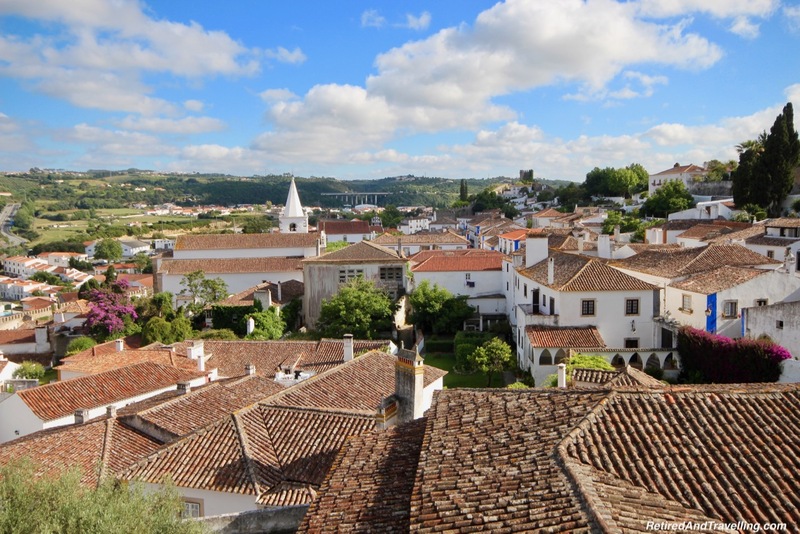 We could look down on the roofs and yards of the houses in the town. 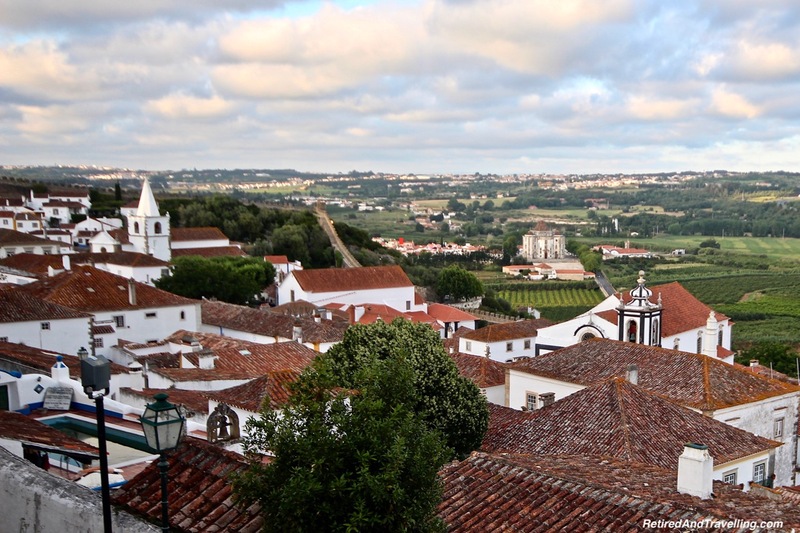 The churches of the town were laid out in front of us. 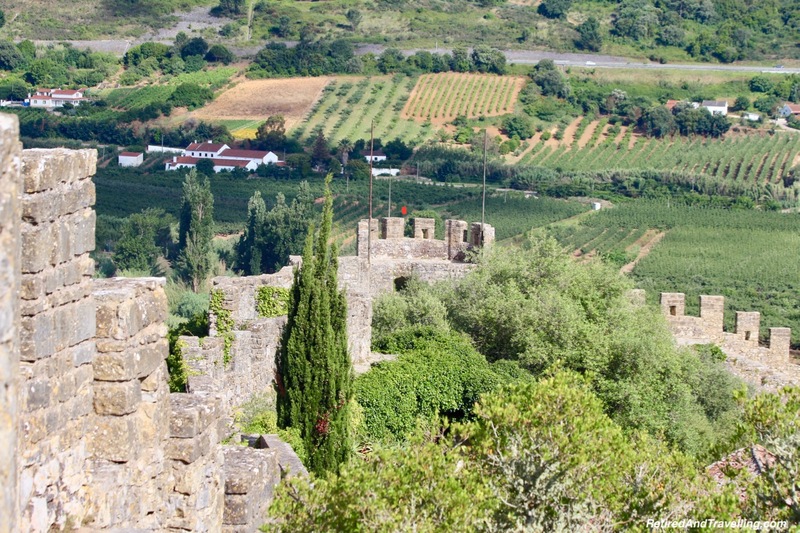 When we looked out over the walls, we saw the vast expanses of farmland surrounding the walled city. 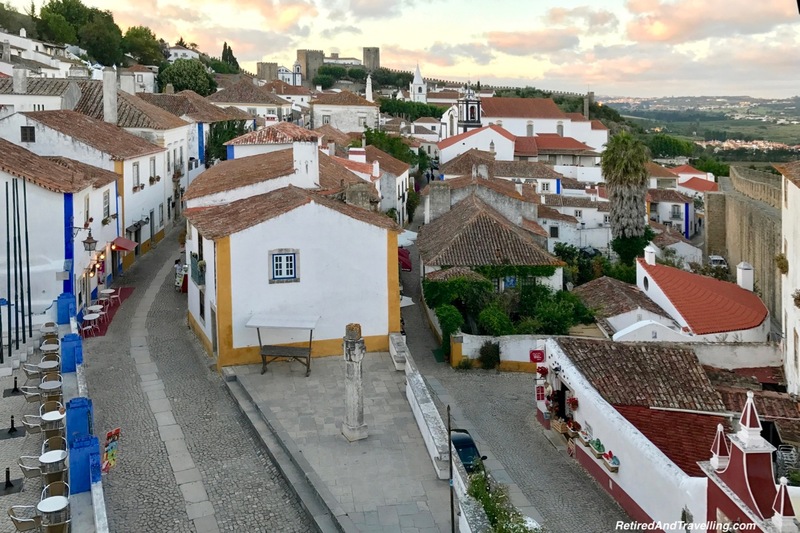 We saw the small town of Obidos outside the walls. Far off in the distance we saw the highway bridge. 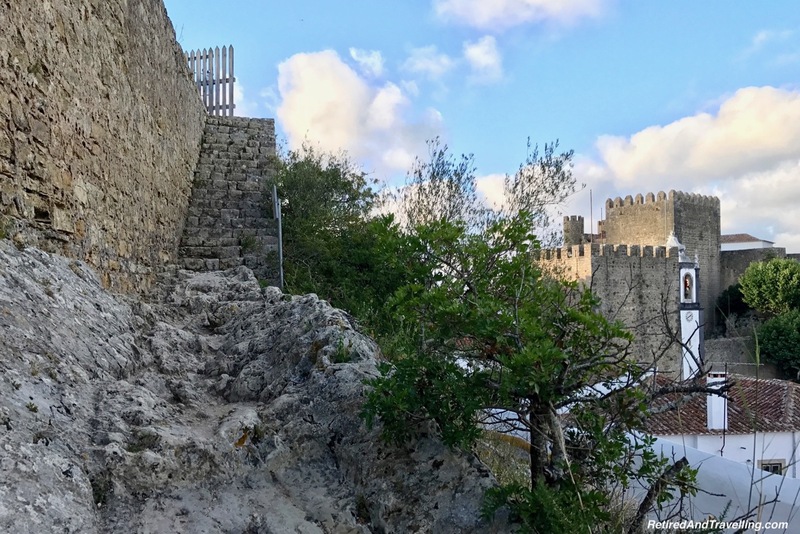 The ancient structures outside the walled city could also be seen. We got a great view of the Sanctuaire du Seigneur Jesus de la Pierre under renovation. 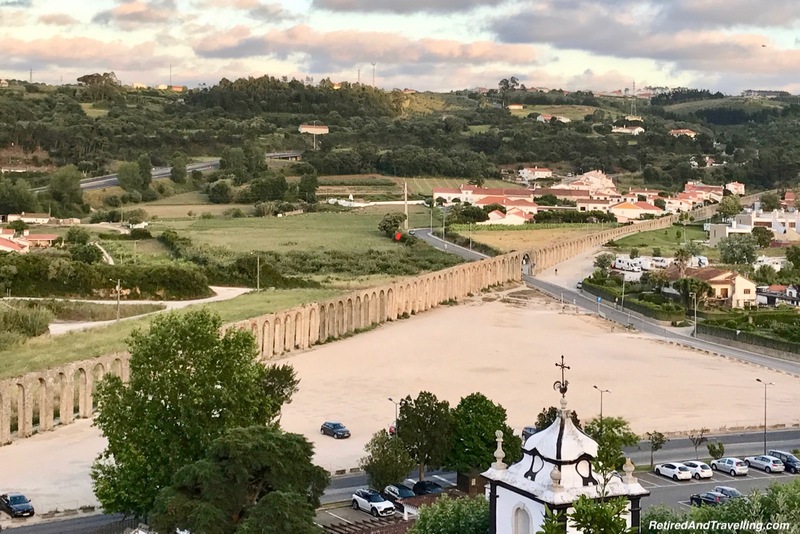 The aqueduct ran straight out from the town. 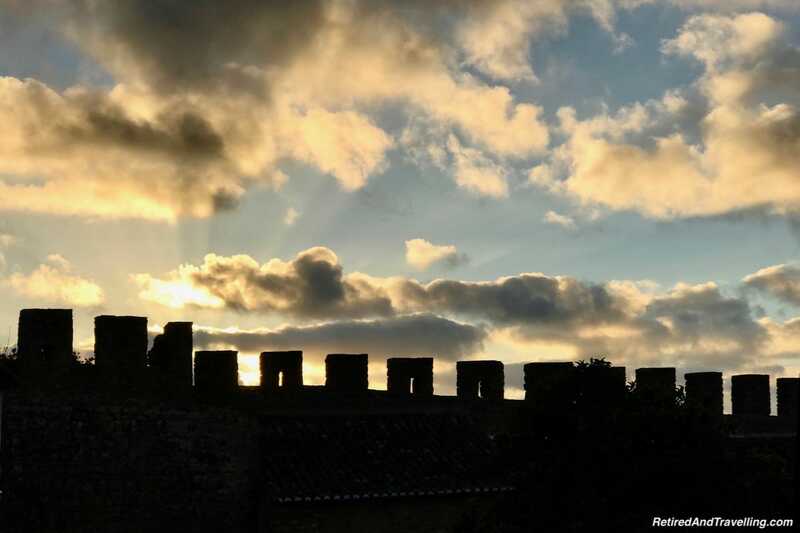 And when we walked on the walls at sunset, we even caught the sun set over the walls. 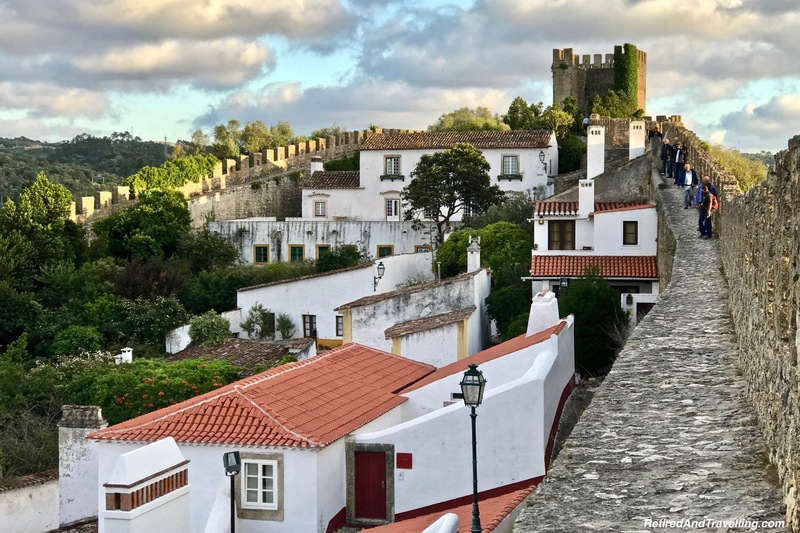 We enjoyed our visit to Obidos. 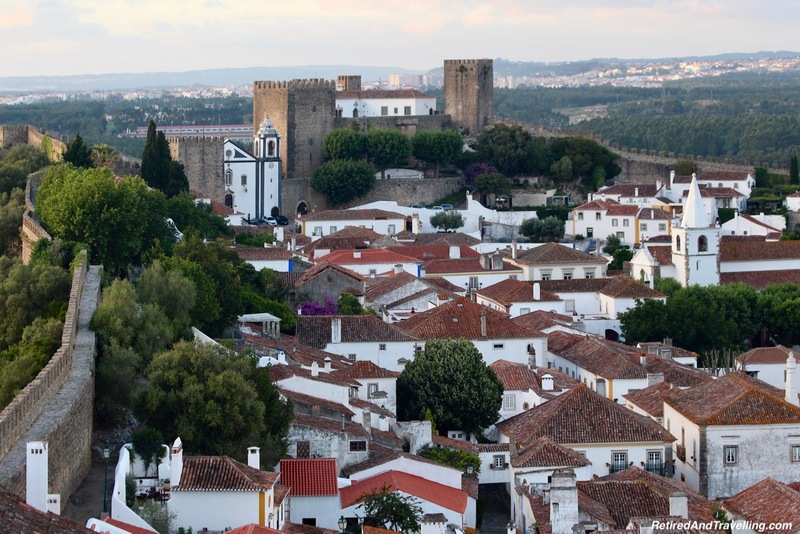 It was a quaint city within the walls and we enjoyed our days just wandering around. 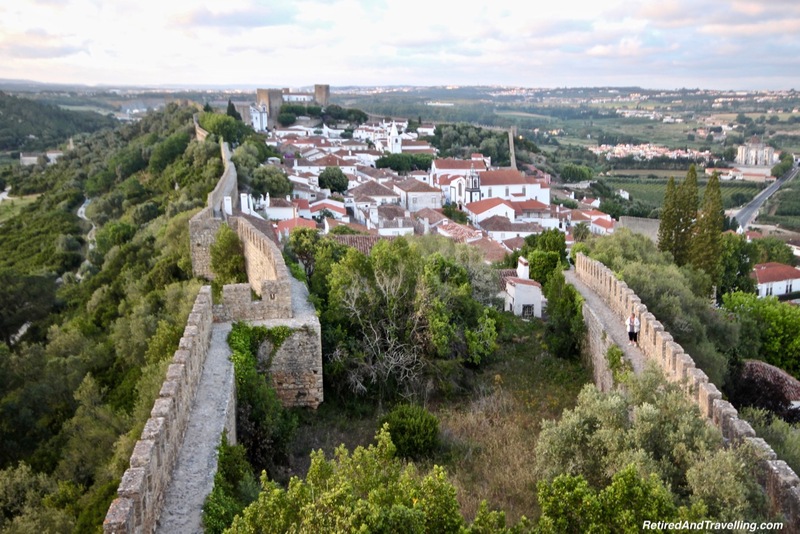 But a walk on the castle walls in Obidos gave us a very different perspective on the walled city. 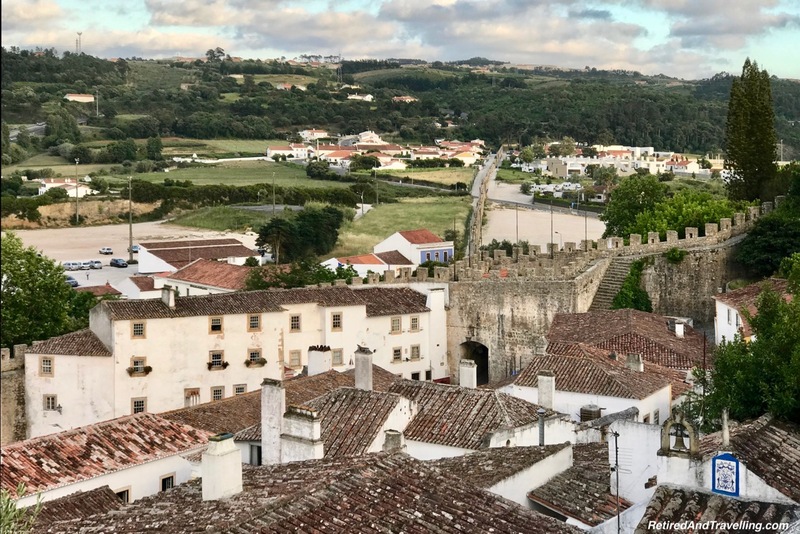 The views from the top of the walls were stunning. But it was not a walk for the faint at heart. 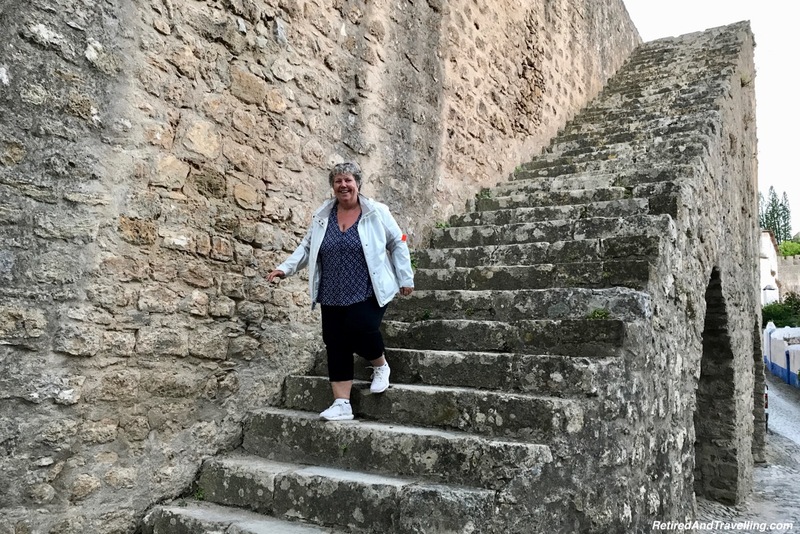 It was a challenging climb up and then the path was uneven with no railings. But you won’t regret the effort! And when you get back on low ground, you can have a taste of Ginja to celebrate! 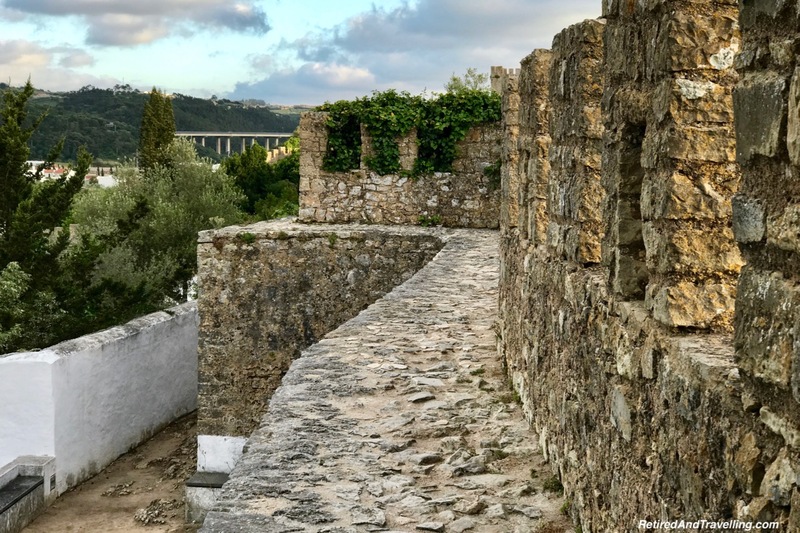 Did you walk on castle walls in Obidos? Was it worth the time and effort to see this small town from above?